Phosgene is a highly toxic substance that exists as a gas at room temperature. Owing to its poor water solubility, one of the hallmarks of phosgene toxicity is an unpredictable asymptomatic latent phase before the development of noncardiogenic pulmonary edema. See the image below. 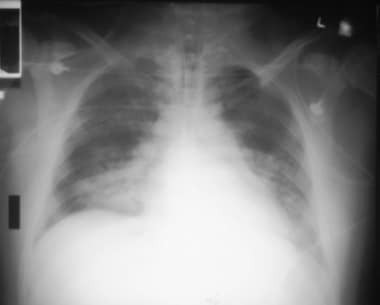 Anteroposterior portable chest radiograph in a male patient who developed phosgene-induced adult respiratory distress syndrome. Notice the bilateral infiltrates and ground-glass appearance Image courtesy of Fred P. Harchelroad, MD, and Ferdinando L. Mirarchi, DO. No test is diagnostic. In addition, for patients who are asymptomatic despite a known recent phosgene exposure, no combination of laboratory or radiographic studies has been shown to discriminate reliably between those who remain asymptomatic and those who are in the latent phase and will later develop life-threatening pulmonary edema. Phosgene (COCl2) is a highly toxic gas or liquid that is classified as a pulmonary irritant. Exposure to phosgene gas produces delayed-onset noncardiogenic pulmonary edema. Immediate symptoms may occur with concentrations as low as 2-3 ppm (throat and eye irritation). [1, 2] This can be followed by a latent period, the duration of which depends on exposure to the chemical. The major pulmonary effects follow. Exposures to 50 ppm may be rapidly fatal. Management of phosgene toxicity is supportive, as no specific antidote or effective elimination process exists. Phosgene is produced and utilized across numerous industries for chemical synthetic processes. Large-scale exposure may occur through industrial accidents. Small-scale exposures most often occur when phosgene is released by heating chlorinated hydrocarbons. Phosgene has been used in the past as a chemical weapon by warring nations and extremist groups. It could potentially be used as a weapon of mass destruction by any group with simple chemical synthetic capabilities or with the means to sabotage an existing industrial phosgene source. The United Nations/Department of Transportation number for phosgene is UN#1076. The American Chemical Society's Chemical Abstracts Service (CAS) registry number for phosgene is #75-44-5. Although it is typically colorless as a gas, phosgene may appear as a white cloud under conditions of concentrated release due to slow hydrolysis with airborne water vapor. Phosgene has a boiling point of 8°C (47°F) and thus exists as a gas at room temperature. Below the boiling point, it exists as a colorless fuming liquid. Vaporization is still significant at lower temperatures, making inhalational exposure possible even in cold conditions. Phosgene is usually transported as a compressed liquefied gas. Direct contact with this form of the substance may produce frostbite injuries. Although phosgene is nonflammable, it is strongly reactive and demonstrates electrophilic properties. It reacts with alkalis, ammonia, amines, copper, and aluminum. It can also attack plastics and rubber materials. Because phosgene is poorly soluble in water, it reacts minimally with oropharyngeal and conducting airway tissues and as a result can penetrate deeply into the lung, where it exerts its effects at the alveolar-capillary membrane (see Pathophysiology). The odor of newly mown hay characterizes phosgene gas, but this olfactory warning signal may not be appreciated by all individuals. Since the odor detection threshold concentration is approximately 0.5-1.5 ppm, which is at least 5 times the permissive exposure limit of 0.1 ppm  set by the National Institute for Occupational Safety and Health (NIOSH) and the American Conference of Government Industrial Hygienists (ACGIH), significant exposure may occur before any unusual scent is perceived. This odor detection threshold approaches the NIOSH-defined immediately dangerous to life and health (IDLH) level of 2 ppm. As a result, the odor of newly mown hay is an insufficient warning signal for dangerously high phosgene levels. Other pulmonary irritant gases, such as chlorine, are so noxious that exposed persons flee the immediate area of release, but persons exposed to phosgene may inadvertently remain in a highly contaminated area, unaware that they are in any danger. Because phosgene is 4 times denser than air, it tends to remain close to the ground and to collect in low-lying areas. This distribution of contamination should be considered when planning evacuation routes in the event of a phosgene release. Children may be at risk for higher exposure levels as a result of increased gas distribution closer to the ground. Children may also be at higher risk for severe exposure to this irritant gas due to their larger minute volume-to-weight ratios and their larger lung surface area–to–body weight ratios. Older people who have an inability to escape rapidly from the exposure also are at greater risk than the average younger adult. Phosgene is used in the synthesis of plastics, pharmaceutical agents, isocyanates, polyurethanes, dyes, and pesticides. It is also used in the uranium enrichment process and in the bleaching of sand for glass production. Industries in the United States produce over 1 billion pounds of phosgene per year. Unfortunately, industrial accidents involving phosgene are not uncommon. A phosgene-containing pipe rupture in 1994 in Yeochon, Korea, resulted in multiple injuries and 3 deaths. In 2000, a phosgene gas leak from a Thai plastics factory killed 1 person and injured 814 others. A laboratory accident involving inadvertent phosgene release in Fuzhou, China, in 2004 killed 1 person and injured more than 260 others. Small-scale exposures to phosgene have also occurred, as phosgene is a product of thermal decomposition of chlorinated hydrocarbons. Such agents include refrigeration coolants, dry cleaning fluids (carbon tetrachloride), metal degreasing agents (trichloroethylene), and paint strippers (methylene chloride). When these chlorinated hydrocarbons are exposed to heat from a source such as a welding torch, a fire, or a heat gun, phosgene may be liberated. Phosgene was used as a chemical weapon in World War I, first by the Germans and subsequently by French, American, and British forces. The term Green Cross derives from the marking on German artillery shells containing phosgene. The initial World War I deployment of phosgene occurred when the Germans released approximately 4000 cylinders of gas against the British near Ypres on December 19, 1915. Because trench warfare typified much of World War I, heavier-than-air gases such as phosgene readily inflicted casualties in these low-lying areas. Between the world wars, phosgene was assigned the military designation CG and was classified as a nonpersistent agent because of its rapid evaporation. Although stockpiled, it was never used in WW II. In military publications, it has been referred to as a choking agent, pulmonary agent, or irritant gas. The extremist cult Aum Shinrikyo used this agent to attack the Japanese journalist Shouko Egawa in 1994. Egawa had been reporting on the cult's activities, and the cult retaliated against her by introducing phosgene into her Yokohama apartment through the mail slot while she slept. Phosgene interacts with biological molecules through two primary reactions: hydrolysis to hydrochloric acid and acylation reactions. Because phosgene is poorly soluble in water, the hydrolysis reaction (COCl2 + H2 O → CO2 + 2 HCl) contributes far less to the typical clinical presentation, but this reaction is likely responsible for the mucous membrane irritant effects observed with exposure to high concentrations of phosgene. The acylation reactions occur with amino, hydroxyl, and sulfhydryl groups on biological molecules, which attack the highly electrophilic carbon molecule in phosgene. These reactions can result in membrane structural changes, protein denaturation, and depletion of lung glutathione. Acylation reactions may be particularly important with phospholipids such as phosphatidylcholine, which is a major constituent of pulmonary surfactant and lung tissue membranes. Studies in animal models have shown that exposure to phosgene vastly increases alveolar leukotrienes, which are thought to be important mediators of phosgene toxicity to the alveolar-capillary interface. Phosgene exposure also increases lipid peroxidation and free radical formation. These processes may lead to increased arachidonic acid release and thus provide more substrate for lipoxygenase (ie, more leukotriene production). In addition, studies have shown that phosphodiesterase activity increases postexposure, leading to decreased levels of cyclic adenosine monophosphate (cAMP). Normal cAMP levels are believed to be important for maintenance of tight junctions between pulmonary endothelial cells and thus for prevention of vascular leakage into the interstitium. On a physiologic level, the most important clinical effect of phosgene toxicity is the development of noncardiogenic pulmonary edema resulting from increased pulmonary vascular permeability due to the damaged alveolar-capillary interface. Up to 1 L/h of serum may leak out the circulation and into the alveolar septa. Similar to other pathologic processes resulting in noncardiogenic pulmonary edema, this state is characterized by heavy, wet lungs that have low compliance. Oxygenation and ventilation both suffer, and the work of breathing is dramatically increased. Current literature describes exposures caused by the combustion products from chlorinated chemicals (eg, methylene chloride, trichloroethylene). For example, use of methylene chloride, a commonly used chemical paint remover, near a heat source allows the release of phosgene. Phosgene is a breakdown product of chloroform that is stored for more than 6 months, even if the chloroform is stabilized with amylene. Any release of phosgene as a weapon of mass destruction would likely produce large numbers of casualties presenting simultaneously with similar symptoms. However, a large industrial accident could result in similar patient arrival patterns. The use of phosgene as chemical warfare in a traditional military conflict is essentially of historical interest. The development of more effective agents and improved personal protective equipment make phosgene an unlikely agent to be used in future battles. Even in World War I, the German army switched to mustard gas in 1917 because of the development of effective gas masks. According to OSHA, millions of kilograms of phosgene are produced annually, with 10,000 workers at risk of exposure. This does not include the large number of people that may have mild-to-moderate exposures in their homes from using solvents (eg, methylene chloride) with heat guns to remove paint. Nevertheless, clinically significant phosgene exposure occurs infrequently. Sporadic exposures in recent years are related to industrial accidents or isolated. In view of currently available war gases, which are much more lethal than phosgene, and improved respiratory protection, military use of phosgene is no longer considered a significant threat. One of the hallmarks of phosgene toxicity is an unpredictable asymptomatic latent phase before the development of noncardiogenic pulmonary edema. Typically, the latent phase lasts 3-24 hours, but it may be as short as 30 minutes or as long as 48 hours after phosgene exposure. The duration of the latent phase is an extremely important prognostic factor for the severity of the ensuing pulmonary edema. Patients with a latent phase of less than 4 hours before the onset of pulmonary edema have a poor prognosis. Increased physical activity may shorten the duration of the latent phase and worsen the overall clinical course. Unfortunately, there are no reliable historical or physical examination findings during the latent phase to predict its duration. Patients who survive the first 48 hours after phosgene exposure have a generally excellent prognosis. Clinical and radiographic improvement often occurs in 3-5 days. Patients who remain significantly ill beyond 5 days should be evaluated for a concurrent disease process such as superimposed infection. No data suggest carcinogenicity or reproductive/developmental hazards in association with phosgene exposure. Many patients report ongoing exertional dyspnea for months or even years after phosgene exposure despite normalized chest radiographs. Some patients may develop reactive airway dysfunction syndrome (RADS), which is an irritant-induced reactive airway process. These patients may benefit from follow-up pulmonary function testing 2-3 months after phosgene exposure, possibly to include a methacholine challenge test. Chronic low level exposure to phosgene (< 0.1 ppm) in a cohort of almost 800 workers at a uranium enrichment facility during World War II resulted in no documented increase in all-cause mortality or respiratory causes of mortality in 35 years of follow-up when matched with unexposed control workers at the same facility. The Occupational Safety and Health Administration permissible exposure limit (OSHA PEL) for the workplace is 0.1 ppm (0.4 mg/m) as an 8-hour time weighted average. The level immediately dangerous to life or health (IDLH) is 2 ppm. Even a short exposure to 50 ppm may result in rapid fatality. Morbidity and mortality are related to the degree of pulmonary insult and subsequent hypoxemia. Delayed diagnosis may result from delayed signs and symptoms. Underlying medical conditions contribute to the patient's ability to withstand the hypoxic insult. In the case of isolated exposures, instruct patients to avoid future exposures and to educate others involved in similar practices. Patients should minimize exertion for several weeks. Determining factors for return to the emergency department should include cough recurrence, dyspnea (especially resting dyspnea), and chest discomfort. Balmes JR. Phosgene. Olson KR, ed. Poisoning and Drug Overdose. 6th ed. New York, NY: McGraw-Hill; 2012. Chapter 127. Grainge C, Rice P. Management of phosgene-induced acute lung injury. Clin Toxicol (Phila). 2010 Jul. 48(6):497-508. [Medline]. Kumar A, Chaudhari S, Kush L, Kumar S, Garg A, Shukla A. Accidental inhalation injury of phosgene gas leading to acute respiratory distress syndrome. Indian J Occup Environ Med. 2012 May. 16(2):88-9. [Medline]. [Full Text]. US Department of Labor, Occupational Safety and Health Administration. Safety and Health Topics: Phosgene. Revised October 10, 2003. Available at http://www.osha.gov/dts/chemicalsampling/data/CH_262200.html. Accessed: May 27, 2009. Parrish JS, Bradshaw DA. Toxic inhalational injury: gas, vapor and vesicant exposure. Respir Care Clin N Am. 2004 Mar. 10(1):43-58. [Medline]. Snyder RW, Mishel HS, Christensen GC 3rd. Pulmonary toxicity following exposure to methylene chloride and its combustion product, phosgene. Chest. 1992 Mar. 101(3):860-1. [Medline]. Nelson LS. Simple asphyxiants and pulmonary irritants. Goldfrank L, ed. Goldfrank's Toxicologic Emergencies. Goldfrank L, ed. Goldfrank's Toxicologic Emergencies. 6th ed. New York: McGraw-Hill; 1998:1530. 6th ed. New York: McGraw-Hill; 1998. 1530. Gresham C, LoVecchio F. Industrial Toxins. Tintinalli JE, Stapczynski JS, Cline DM, Ma OJ, Cydulka RK, Meckler GD, eds. Tintinalli’s Emergency Medicine: A Comprehensive Guide. 7th ed. New York, NY: McGraw-Hill; 2011. Chapter 198. Sciuto AM, Clapp DL, Hess ZA, Moran TS. The temporal profile of cytokines in the bronchoalveolar lavage fluid in mice exposed to the industrial gas phosgene. Inhal Toxicol. 2003 Jun. 15(7):687-700. [Medline]. Qin XJ, Li YN, Liang X, Wang P, Hai CX. The dysfunction of ATPases due to impaired mitochondrial respiration in phosgene-induced pulmonary edema. Biochem Biophys Res Commun. 2008 Feb 29. 367(1):150-5. [Medline]. Grainge C, Smith AJ, Jugg BJ, Fairhall SJ, Mann T, Perrott R, et al. Furosemide in the treatment of phosgene induced acute lung injury. J R Army Med Corps. 2010 Dec. 156(4):245-50. [Medline]. Seldén A, Sundell L. Chlorinated solvents, welding and pulmonary edema. Chest. 1991 Jan. 99(1):263. [Medline]. Sjögren B, Plato N, Alexandersson R, Eklund A, Falkenberg C. Pulmonary reactions caused by welding-induced decomposed trichloroethylene. Chest. 1991 Jan. 99(1):237-8. [Medline]. Weiss SJ, Lesser SH. Hazards associated with metalworking by artists. South Med J. 1997 Jul. 90(7):665-71. [Medline]. Schelble DT. Phosgene and phosphine. Haddad LM, Shannon MW, Winchester J, eds. Clinical Management of Poisoning and Drug Overdose. 3rd ed. Philadelphia: WB Saunders; 1998. 78(5): 960-3. Bardana EJ Jr. 8. Occupational asthma and allergies. J Allergy Clin Immunol. 2003 Feb. 111(2 Suppl):S530-9. [Medline]. Chen HL, Hai CX, Liang X, Zhang XD, Liu R, Qin XJ. Correlation between sPLA2-IIA and phosgene-induced rat acute lung injury. Inhal Toxicol. 2009 Feb. 21(4):374-80. [Medline]. Shen J, Wang J, Shao YR, He DK, Zhang L, Nadeem L, et al. Adenovirus-delivered angiopoietin-1 treatment for phosgene-induced acute lung injury. Inhal Toxicol. 2013 Apr. 25(5):272-9. [Medline]. Borak J, Diller WF. Phosgene exposure: mechanisms of injury and treatment strategies. J Occup Environ Med. 2001 Feb. 43(2):110-9. [Medline]. Parkhouse DA, Brown RF, Jugg BJ, Harban FM, Platt J, Kenward CE, et al. Protective ventilation strategies in the management of phosgene-induced acute lung injury. Mil Med. 2007 Mar. 172(3):295-300. [Medline]. Phosgene Medical Experts Group. American Chemistry Council: Phosgene Panel. Phosgene: Information on Options for First Aid and Medical Treatment. Toxicol Ind Health. Available at https://www.americanchemistry.com/ProductsTechnology/Phosgene/PDF-Phosgene-Information-on-Options-for-First-Aid-and-Medical-Treatment.pdf. January 2014; Accessed: January 21, 2017. British War Office. Medical Manual of Chemical Warfare. 1941. 31-38. Sciuto AM, Stotts RR. Posttreatment with eicosatetraynoic acid decreases lung edema in guinea pigs exposed to phosgene: the role of leukotrienes. Exp Lung Res. 1998 May-Jun. 24(3):273-92. [Medline]. Sciuto AM, Strickland PT, Kennedy TP, Gurtner GH. Postexposure treatment with aminophylline protects against phosgene-induced acute lung injury. Exp Lung Res. 1997 Jul-Aug. 23(4):317-32. [Medline]. Sciuto AM, Stotts RR, Hurt HH. Efficacy of ibuprofen and pentoxifylline in the treatment of phosgene-induced acute lung injury. J Appl Toxicol. 1996 Sep-Oct. 16(5):381-4. [Medline]. Sciuto AM. Assessment of early acute lung injury in rodents exposed to phosgene. Arch Toxicol. 1998 Apr. 72(5):283-8. [Medline]. Kennedy TP, Michael JR, Hoidal JR. Dibutyryl cAMP, aminophylline, and beta-adrenergic agonists protect against pulmonary edema caused by phosgene. J Appl Physiol. 1989 Dec. 67(6):2542-52. [Medline]. Sciuto AM, Strickland PT, Kennedy TP, Guo YL, Gurtner GH. Intratracheal administration of DBcAMP attenuates edema formation in phosgene-induced acute lung injury. J Appl Physiol. 1996 Jan. 80(1):149-57. [Medline]. Sciuto AM, Strickland PT, Kennedy TP, Gurtner GH. Protective effects of N-acetylcysteine treatment after phosgene exposure in rabbits. Am J Respir Crit Care Med. 1995 Mar. 151(3 Pt 1):768-72. [Medline]. [Guideline] Agency for Toxic Substances and Disease Registry. Medical management guidelines for phosgene. Available at https://www.atsdr.cdc.gov/MMG/MMG.asp?id=1201&tid=182. October 21, 2014; Accessed: December 28, 2017.
de Lange DW, Meulenbelt J. Do corticosteroids have a role in preventing or reducing acute toxic lung injury caused by inhalation of chemical agents?. Clin Toxicol (Phila). 2011 Feb. 49(2):61-71. [Medline]. British machine-gunners in anti-phosgene masks, Somme, 1915. Courtesy of the Imperial War Museum, London. The chest radiograph of a 42-year-old woman chemical worker 2 hours after exposure to phosgene. Dyspnea progressed rapidly over the second hour; PO2 was 40 mm Hg breathing room air. This radiograph shows bilateral perihilar, fluffy, and diffuse interstitial infiltrates. The patient died 6 hours postexposure. Used with permission from Medical Aspects of Chemical and Biological Warfare, Textbook of Military Medicine, 1997, p 258. A lung section of the patient who died 6 hours after exposure to phosgene; the biopsy section was taken during postmortem examination. The section shows nonhemorrhagic pulmonary edema with few scattered inflammatory cells. Hematoxylin and eosin stain; original magnification X 100. Used with permission from Medical Aspects of Chemical and Biological Warfare, Textbook of Military Medicine, 1997, p 258. The views expressed in this article are those of the authors and do not reflect the official policy or position of Naval Medical Center San Diego, the Department of the Navy, the Department of Defense, or the United States Government.